In a May 1867 letter to the San Francisco Alta California, Mark Twain wrote: “A railroad is like a lie—you have to keep building to it to make it stand.” When Twain penned the letter, the lie was one of promise. He reminds the Alta California: “A railroad is a ravenous destroyer of towns.” Along with the industry the railways brought, so, too, did they suggest a way onwards. They provided a means of travel to the American West and the South, and could funnel passengers into the great metropoles: Chicago, New York, San Francisco. Commerce flowed at an unprecedented rate. With the advent of the train, the country opened up. Passenger rails allowed those who could afford a ticket to see parts of the country never before glimpsed by the masses: valleys in the Rocky Mountains, the Great Lakes, the bright blue runoff water from the Sierra Nevadas. Traversing the country was a matter of practice. The railroad had great potential for lies, a ‘lie’ herein being the aspects of the railroad that fell in contrast with its promise of progress and expansion. There were the lies of its infrastructure: the shaky trestles and steep inclines, its potential to reshape towns and slice through neighborhoods. There were the passenger lies—the train is remembered for its white, wealthy passengers. Train cars of enslaved peoples were brought throughout the South by rail. The railway allowed the slave trade to continue—in fact, it made it more efficient. The railways were built by immigrant labor. It was hard and dangerous work. The railroad is also full of warnings. Dr. James Anderson from Edinburgh, Scotland, wrote in 1801—years before the railway became necessity, back when it was still invention—that the railway should never be made the subject of control by the “‘avaricious money-lender,’” warning against the privatization of the new industry: “All is necessary to prevent these railways from ever becoming private property on any account.” Anderson’s warning would weave in and out of truth through the next two decades. The rails would become privatized, and they would stay that way for a long time—through their boom, through the Great Crash of 1929, through the birth of the automobile industry, the Second World War, the 1950s, and the birth of the American highway system. All the way up to the 1970s, the railways would remain private. The formation of Amtrak changed that. The company is for-profit but functions as a public entity, and it receives funding from the US government. Public opinion holds that the railways—in their semi-public state—are rolling towards their end. In the spring of 2017, the Trump administration announced numerous budget cuts to Amtrak, slashing funding for the long-distance passenger trains and eliminating money for infrastructure repairs and personnel increases. Not only was train service at risk of worsening, but it appeared to suddenly face a future towards which its been rolling for years—complete elimination. Perhaps Dr. Anderson was wrong, and privatization might be able to sustain the rail system. The railroad tells a great many lies. The question now is—to which of them do we listen? In August of this year, I rode around the continental United States on Amtrak’s long-haul passenger trains. I wanted to learn why people still ride the train, to understand what truths train-riders choose to believe. I have always seen the train as a place of nostalgia. This nostalgia lingers in our public consciousness—look at the recently released film adaptation of Murder on the Orient Express. The fascination with passenger trains and the inherent glamour they call to mind doesn’t appear to be waning. This nostalgia feeds on a lie—the cultural image of trains as the paragon of glamour, whizzing connectors that joined the country. Both of these things are true in part, neither in whole. I assumed I was not alone in my nostalgia; on the train, I learned this was the case. The first train buff I met was Gene Ednes, a septuagenarian from Ithaca, New York. We met on the Lake Shore Limited at 7 am passing through Ohio. The Lake Shore runs between New York City and Chicago, up through the Hudson River Valley and along the Great Lakes. Ednes told me he’d taken the Lake Shore seven or eight times, and all of Amtrak’s other long-haul trains at least once. “You have a favorite?” I asked him. Ednes and I talked for a long time. He told me he takes the train whenever possible. He loves it—he always had, he always will. His wife usually flies to meet him at their destinations. She’ll take the train with him occasionally, but she doesn’t love it like he does. He tells me that if I want to meet other trains buffs, I should linger in the vestibules between train cars. Most train buffs I met were like Gene, white and male. Many of them harbored an obsessive knowledge of the train routes and history. They could list off freight lines and track ownership rights. On the California Zephyr, travelling between Chicago and San Francisco, I met two parents travelling with their young son. The parents, Ben and Charlene, had taken their son Benjamin Patrick to Rochelle, Illinois, from San Jose, California, so that Benjamin Patrick could watch the freights pass in the Rochelle freight yards. The yards are famous for their daily freight traffic. When we spoke, Benjamin Patrick relayed his stored knowledge of the train. He told me how trains could pull large amounts of cargo using much less energy than a truck might for the same load. Trains, he (a ten-year-old) suggested, are relevant when we consider how to approach our response to climate change. I met one female train buff during my time on the train. Her name was Anne, she is from Rhode Island, and she specializes in the study of dragonflies. Like Gene, she takes the train whenever possible. “Are you doing it alone?” I asked her. “I always go alone,” she tells me. Oftentimes her husband will meet her by plane at their destination. She and I traded off saving seats for each other in the California Zephyr’s glass-walled observation car. Two women looking out. The train buffs represented a special class of nostalgia on the train, one of reverence and boundless interest. Many of them have seen the same landscapes time and time again. The routes do not get old. The nostalgia of the train buffs is soft-spoken. They do not advertise it, perhaps because the railways are as much a part of their present as they were their past. Many individuals I met take the train because they don’t like to fly. For some, airplanes cause anxiety. For others, many of them over fifty years old, they believe, as one woman put it, that “flying is not what it used to be.” For individuals who feel as though the government and the TSA have too much access to their lives, the train provides a worthy means of getting places. There is no security, no pat-downs or checking of IDs. The train lets its passengers exist in a realm of relative leeway. Most behavior is tolerated. The individuals I met who were on the train because they didn’t like to fly spoke of both flying, and the train, with a heavy dose of nostalgia. Two women, who I spoke to separately, recalled trips on the old Pullman rail cars with their parents. The train turns trips that can take three hours on a plane into multi-day journeys. Very few people I met seemed to mind. The persistent statement throughout the trains I rode was that the train was better—better than planes, better than cars. The best way to travel and see the country. Not because it is faster, or more comfortable, or more convenient. It is none of those things. It was better because it filled a niche in the (white, middle class) American imagination as a means of surveying the country. How else might one wake up near Glacier National Park, eat lunch rolling alongside the Blackfoot Indian Reservation, and fall asleep outside of Fargo, North Dakota? Nostalgia is dubious and I reveled in it. I kept notes on most things I saw and most people I talked to. Trump voters I met from middle America became emblems of a frustrated agricultural sector, subsumed by the great Monsanto empire. A seatmate of mine from the Coast Starlight who was arrested during our trip for fornication in the café car came to represent the underbelly of the train microcosm, and the potential for intimacy in a train full of strangers. Train buffs like Gene and Anne were my Mark Twain characters. Twain longed for a life of movement on the Mississippi River. Gene and Anne sought that life on the the train. My nostalgia played out as ignorance-turned-awe for much of my trip across the country. Born and raised on the East Coast, I marveled at the prairie. For long stretches of time, the train passed only corn and houses, no people. In late afternoon we entered Iowa. Dirt roads meeting other dirt roads at the railroad crossings, forming long dirt crosses through the corn fields. Around dinner it became Nebraska, but there was no change in the scenery to announce this, only the appearance of wheat, golden and corn-high. Nostalgia is a lie because the train, as it is now and not as it was, is worth marveling over. It rolls towards its decline. It gets delayed, sometimes as my Coast Starlight did, for eight hours at a time. The history of the train is unkempt. The train could be elegant. It could also supply wars, move slaves, destroy the urban fabric of cities and towns. The train reveals the country’s inheritance in a way no other form of transport can. I met a great many people who are fearful for its end, who see the eulogy coming and will read it with acceptance and sorrow. The railroad does not lie in that it cannot mask the spaces through which it moves. It cannot disguise poverty; it cannot mask the errors in its infrastructure. Its greatest attribute lies in the horizon lines outside its picture windows. 6:30am—Woke up to sunrise over Lake Erie. I spent the first thirty minutes of my morning watching Cleveland go by. First the stadiums, then marinas on the lake shore, then the downtown comprised of highways and cement buildings and the airport all touched with purple by sunrise. 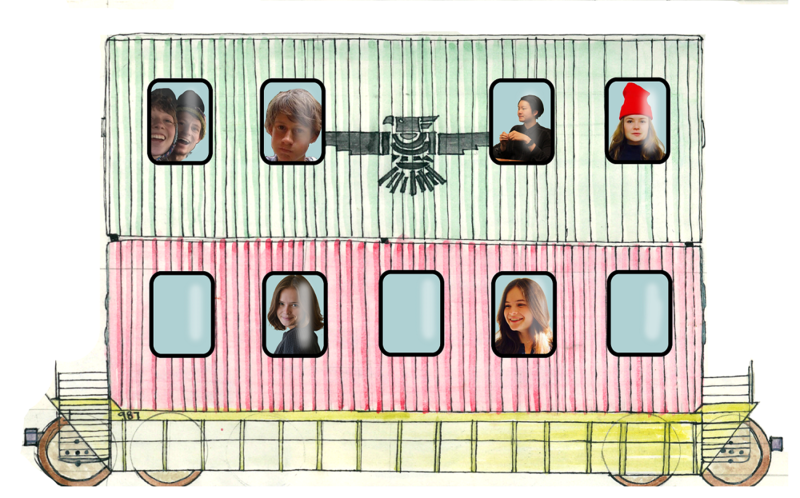 JULIA TOMPKINS B’18 is riding in the space between train cars.